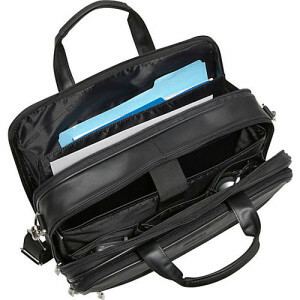 It’s not always easy trying to find a professional looking briefcase that is sturdy enough for everyday use. The Kenneth Cole Reaction “I Rest My Case” leather briefcase is a popular choice if that’s what you’re looking for, and it enters at number 6 in our Top 15 Best Leather Briefcases chart. In my review, I’ll be looking at what makes this briefcase so highly rated and how it compares with other similar leather briefcases. Good quality and solidly built briefcase. Ideal for everyday work or casual use. A good amount of storage space inside. A lot of different compartments to keep things organized. 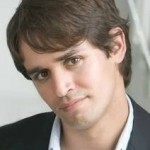 Not very expensive and provides excellent value. May be a problem fitting thick binders or books because of the dividers. Zippers clash against each other and jingles. Dimensions (inches) - 16" x 12" x 4.75"
Considered to be a medium sized briefcase, Kenneth Cole Reaction’s “I Rest My Case” briefcase is not too small that you cannot carry much, yet it’s not too big that it’s awkward to carry around. 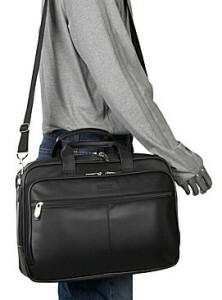 It looks professional and at the right place in an office environment, but it can also pass as a casual bag. The exterior is constructed of top grain nappa leather which is very soft and comfortable to touch, and it features sturdy silver metal zips and D-rings. Unlike messenger bags and many professional briefcases, the “I Rest My Case” bag features zippers at the top instead of a flapover, which means that its contents can quickly and easily be accessed, even when carried via the shoulder strap. However, the zippers can be a bit annoying as they often clash together when you’re on the move, making jingle sounds. There are thin yet durable leather handles that are well stitched on each end of the briefcase. Though they are easy enough to hold for long periods of time, it would have been more comfortable if they were more padded at the top. The good news is that the leather shoulder pad is well padded so it’s comfortable when you’re carrying it on your shoulder. You’ve probably already noticed that there are quite a lot of zippers on this briefcase. There’s a quick access zipper compartment right at the front which you can fit in non-bulky items, and also another at the back which is open and has no zipper to access it, but it provides more depth than the front compartment. There are essentially three main large compartments. The first compartment has zippers that can be zipped down near to the bottom and it opens up quite wide to reveal a large section that has a small pocket, two pen holders and card holders with a zipper compartment just above them that can fit some slim items. The middle compartment accessed by zippers that doesn’t all the way down fully. This is presumably because it’s where the laptop is stored and it needs more security. It has a fully padded laptop section that has a Velcro strap protector to make sure that your laptop is secured properly. There’s a spacious section in front of that where you can put all your laptop accessories. The third and last main compartment has zippers that can be unzipped all the way just past the bottom edges so that it can open up wider. In here, there are two sections separated by a single divider, where you can store any files or documents. There are plenty of different sections for you to keep all your things organized, which is especially important if your professionalism requires plenty of documents. However, if you have a really thick binder or book, you may find it troublesome to fit it in any section simply because of all the dividers. 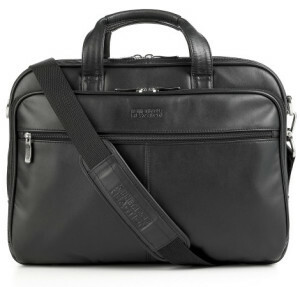 I can see why the Kenneth Cole Reaction “I Rest My Case” Leather Briefcase has garnered such favorable reviews. It’s versatile, spacious, practical and great for any professional or casual environment. 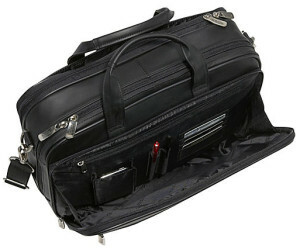 Unlike many other leather briefcases around its price range, this briefcase is durable and can be used everyday. This is one of Kenneth Cole’s best briefcases, but if you prefer something that looks a bit more luxurious, I recommend that you check out “Show Business” by the same brand.